Now, that may sound strange coming from a business, but it’s exactly who we are and what we do at CMI. We want to help you repay what you owe, without placing any unrealistic expectations or undue burdens on your current situation. We’re here to help provide you with a workable and realistic solution toward resolving your debt, whether that’s a balance accumulated over time or a past-due invoice that simply went unnoticed. You see, in the end, we share an important goal – maintaining your overall financial well-being. We hope we can both commit to working together toward a solution that helps you and our client at the same time. "Thank you for your help in moving forward to resolve our account. I appreciate your willingness to work with us and create options to benefit both of our companies. Your collection approach is refreshing and helpful." "I have been in business for the last 25 years and our company employs hundreds of people, so I have developed a strong sense of respect for people who are delivering excellent services and products while treating others with respect and understanding." "I was absolutely stunned by your kind attention to what I had to say, friendly and diplomatic manner of conducting business on behalf of CMI and your client’s company. I appreciate your willingness to work with us and create options to benefit both of our companies." CMI developed this secure bill resolution site as a convenient way to help you fulfill your payment obligations. We use the latest encryption technology to ensure your information will be kept secure, confidential and safe. Our website can handle your payments quickly and easily 24/7. Accounts are updated every morning by 9:00A.M. EST, Monday through Friday, so you can conveniently check your most recent transaction and current balance. You can also pay your bill, schedule a future payment, record a promise to pay or request paperwork. You can make payment arrangements, as well as update your contact information or send a message to us. You will need your CMI file number to access your specific account. 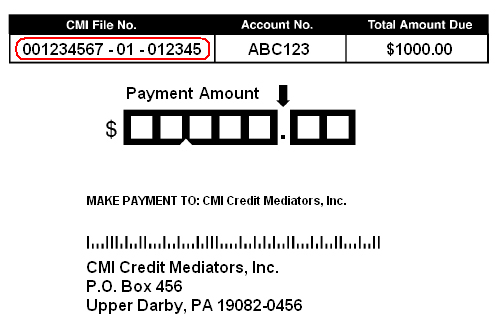 The CMI file number can be found at the top of any of correspondence sent by CMI or by calling an account representative at 610-352-5151. You have the option to pay your bill by debit from your checking account or charging it to a major credit card. An ACH debit will deduct the funds from your bank account without the hassle of writing a check. Plus, you save time and the money on stamps! And, by using your credit card, you can take care of your entire collection balance today and still have the option to make the small monthly payments that you might require. It is as easy as the press of a button. Please note, that all payments made for less than the full balance will be processed as partial payments on the account unless a prearranged settlement agreement has been written and signed. Where do I find my CMI file number? We understand that life has its ups and downs. Sometimes, unexpected events happen completely outside our control and put us in a situation where we incur debt. Whatever the reason, we’re not here to judge, find fault or point fingers. Looking for assistance on how to repay or settle your debt? By visiting our site, you’ve already taken the first step to resolve the matter. We offer flexible re-payment plans, possible opportunities for settlement and convenient, easy on-line payment options. Please fill out the information form to the right to begin the process. A CMI credit counselor will contact you within 1-2 business days. What is a CMI file number? A CMI file number is a unique code that helps us to indentify your account. It is included in statements or letters from CMI to you or by email. How can I request a CMI file number? If you did not receive a CMI file number, or are having trouble with one you received, we would be happy to provide you with one. Just contact us at 610-352-5151 and we’ll help step you through the process or (click here to request your file number). Will my payment information be kept secure and confidential on your site? We use the most up-to-date SSL encryption technology when processing payments for maximum data safety and security. Yes! We offer many flexible ways to pay down your debt. One popular way is to setup a payment plan over time by making regular installments. Not paying your bill can negatively impact your credit score, which could reduce your ability to purchase goods and services on credit. Depending on the balance as well as other factors, the client could decide to initiate legal action to recover their funds. Our goal at CMI is to find a resolution to your debt and a payment structure that works best for you before incurring any impact on your business. What if I have cash flow issues because my customers haven’t paid me? We hear this often from businesses and we would be happy to try to recover those funds for you. However, it would be a conflict of interest to take you on as a client while you still have an outstanding balance. Once your balance is cleared, our sales department would be able to discuss your collection accounts and come up with a solution for you. What if I received a notice from CMI, but I believe it is in error? 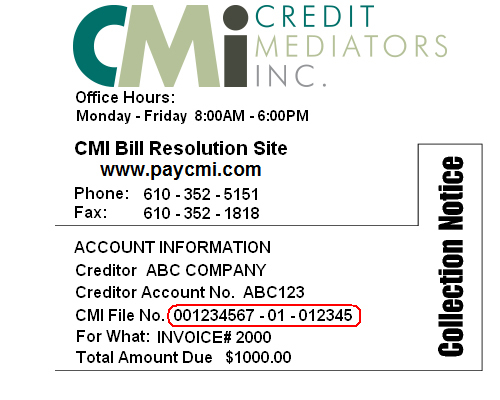 If you received a notice from CMI about a debt being owed and you believe it is in error, please contact us at 610-352-5151 or by email at info@paycmi.com so we can resolve that for you quickly. Below are a list of helpful resources online that can help your business finances, including things such as business loans, accountants, financial advice and debt resolution programs.